So, you’ve decided to develop your own live trivia game show format for mobile. But have you thought about how to monetize it? One of the simplest ways to make money with a media application is using what the advertising industry calls the eyeball model. This means that your advertisers will pay for every pair of eyeballs that their content reaches during a broadcast. And with a live interactive trivia app, you are able to offer the one thing traditional media companies struggle to achieve: engagement. Demonstrable engagement is the key to successfully delivering value to advertisers, and will, therefore, result in higher prices per view. How much higher, you ask? Well, market leader HQ Trivia reportedly earned $10 million from ad deals in 2018. So, without further ado, let me show you 3+1 examples of how you can include sponsored content in your live trivia app to significantly increase your revenue. Let’s start with the big one. Why not go all out and let your partners sponsor an entire show? It is the most overt format, but it is the one that provides the most value for your advertiser and therefore the one that will generate the most revenue for your business. On top of enticing users with a larger-than-average jackpot, a sponsored show can cost an advertiser anywhere from $100k to millions of dollars, depending on how many users you have, of course. Warner Brothers reportedly paid HQ Trivia $3 million to promote 3 upcoming movies — that’s a cool million each, which isn’t too bad, right? To be fair, it’s important to keep in mind that HQ Trivia’s sponsored Ready Player One show brought in 2.4 million players. HQ Trivia also aired a Disney-sponsored game in late 2018, for “only” 775,000 players. You’re all familiar with pre-roll ads from YouTube, right? Well, as it turns out, they can work beautifully in a live trivia app as well. Before the show is scheduled to begin, there is a countdown, typically ranging from 3 to 10 minutes long. This is to ensure that people have time to access the app well before the live show starts. During the countdown, broadcasting helpful tips and funny messages is a top-tier best practice — but there is also no better place for a pre-roll video. People are already watching the app screen, but they don’t really have anything to do. For example, Warner Brothers seemed to enjoy the results they achieved with HQ Trivia so much that they went for another pre-roll partnership for the movie Meg. It’s one thing to play an ad during the game’s countdown timer — but the experience can be supercharged through strategic promotion. Imagine the following scenario: at the end of any given game, you tell users to arrive early to an upcoming game with an even larger prize: people who make it for the countdown will be provided with a clue that will be related to one of the in-game questions. Then, during the countdown, you play the pre-roll ad for the huge number of early birds that are looking for a hint. As a tie-in, the 2nd question can be about the main selling point your client wants to communicate via their ad. You could even play back the part of the ad that contains the answer before it is revealed in the app. With live trivia, you have tangible engagement that no YouTube pre-roll ad can even come close to providing — and let’s not even mention traditional TV advertising. If an advertising partner finds your app’s user demographics particularly interesting, you might be able to enter into a longer engagement. For a couple of shows, or for an entire season, they could have a spot on each game, either during the beginning or potentially as a sponsor for the winner reveal. The advertiser could generate a unique coupon code for participants to use when signing up for their service or buying their product to track the success of their campaign. Think of this system as a variation on channel sponsorships, which are well-known on YouTube. However, I do recommend checking your local advertising laws regarding sponsored content: you might need to explicitly declare that users will be viewing an ad at some point during the broadcast. A great way to expand the number of options in your advertising portfolio is to include your social media presence as a purchasable product. Here’s how you can combine a pre-roll style video ad with a sponsored question to be used as a bridge between your various media assets. Tell players that they should follow you on social media, because from time to time, you will be posting fun behind-the-scenes footage, bloopers, information about upcoming shows, and most importantly, hints about upcoming questions. Some of these clues can be shared as a video ad or another product-related content segment that is important to your advertising partner. For example, to stick with the company mentioned above, you can link to MKBHD’s newest Samsung Galaxy S10 video review and tell your followers that one of the questions in an upcoming game will reference the review. As a best practice, I suggest keeping the questions that include sponsored content near the beginning of the game, since that’s where they have the potential to garner the most engagement. As users play along and miss a question or two, they might tune out, reducing the total addressable size of your audience. This is the number that matters to your advertising partners. Another potential monetization option is having an advertiser sponsor extra lives for your trivia app. There are several ways for this scenario to play out. If you have referral codes that players can use to invite their friends, you can generate a specific set of codes for an advertising partner. They can then choose to give a code to any customer that completes a desired action. They may also choose to print them inside the cap of a beverage bottle, for example. Or, to keep things simple, they might send an email to customers who subscribed to their mailing list within a particular time frame. 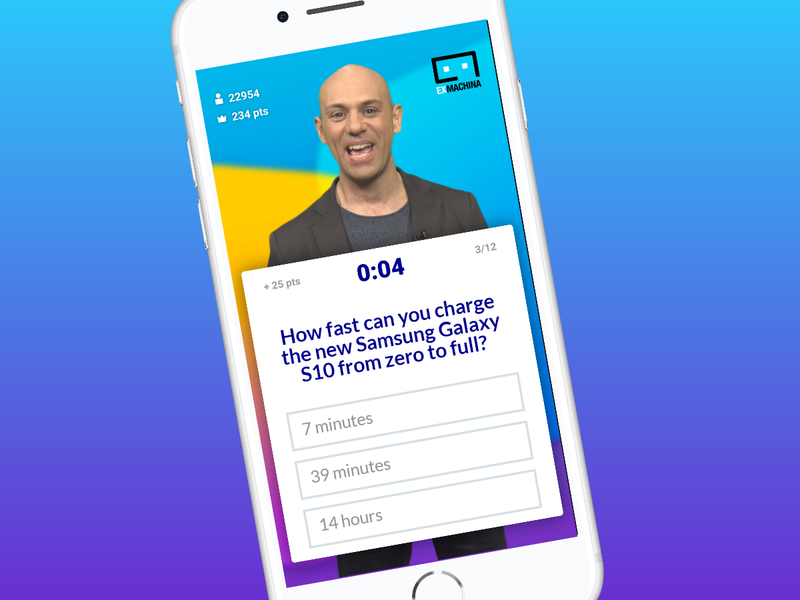 So, there you have it: 4 ways to start monetizing your live trivia app’s audience, primarily via sponsored content options that are already well-known to advertising partners. As a live trivia app, however, your strongest selling point is that you can offer them tangible engagement. Let us know if you have tried any of these, or have a monetization of your own in the comments below. If you are interested in getting your live trivia idea off the ground, get in touch. At Ex Machina Group, we provide everything you need to launch your very own live trivia solution, including concept creation, business modelling, front-end design, back-end development, and operations. Check out our website to get inspired by our portfolio and client list. You can also contact me directly on LinkedIn. The best stories from the Ex Machina Team. We develop innovative, interactive, multiscreen solutions for brands, media, and e-commerce companies. Our concepts, designs, apps, and platforms reach tens of millions of users, powering thousands of hours of interactivity worldwide.